Elizabeth Warren’s tireless trolling of Donald Trump has been one of our few means of solace over the course of an election cycle bleaker than any Lars von Trier film. And today, she had yet another message for him regarding sexual assault and, of course, “nasty women” — a buzzword born from Trump’s puerile name-calling in the final presidential debate. As ABC News reports, the Massachusetts senator joined Hillary Clinton for a campaign event in Manchester, New Hampshire today, where she sang the Democratic nominee’s praises and condemned the furry public toilet fungus running against her. And as Senator Warren elaborated, Trump’s pettiness is far from his most damning attribute. She made reference to the Access Hollywood tape in which Trump bloviated about his sexual mistreatment of women. “He thinks that because he has a mouth full of Tic Tacs that he can force himself on any woman within groping distance,” she quipped. 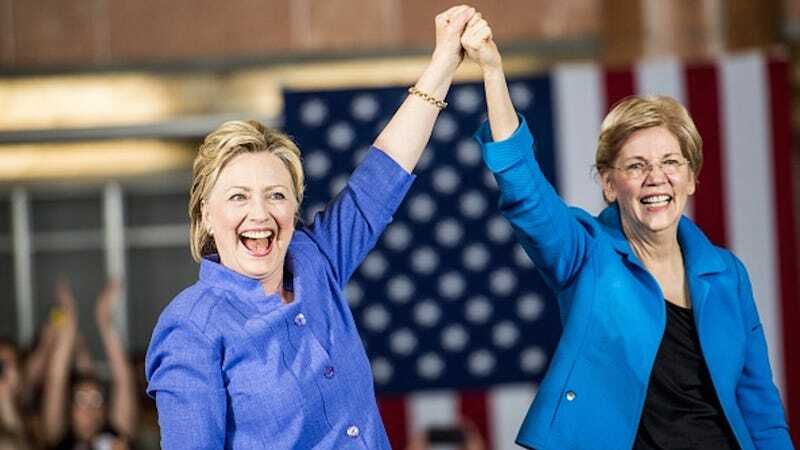 Women’s response, Warren suggested, should be to take to the polls and, with a vote for Clinton, demonstrate that they condemn Trump’s misogyny. In so doing, she implicitly praised Clinton—and emphasized our solidarity—by treating “nasty” as the compliment Trump did not intend.